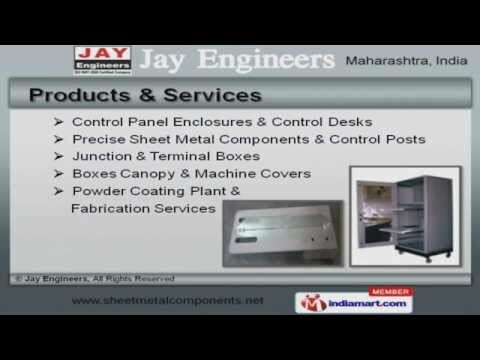 Welcome to Jay Engineers, Manufacturer and Exporter of Metal Control Panel Enclosures. We are an ISO 9001:2008 certified company, established in 1986, at Pune. Our Efficient R&D division and rigorous quality checks help us to cater Indian Subcontinent and North America. Our client list includes Electronic Machine Tools Limited and Cabinet Systems private limited and we are backed by durable and safe packaging. Terminal Boxes, Boxes Canopy and Machine Covers are some of our products and services. Our Control Panel Enclosures and Control Desks are best in the industry amongst others. We offer Precise Sheet Metal Components and Control Posts that are widely acclaimed in the market. Junction and Terminal Boxes offered by us are reckoned all over the world for their superb quality. We are specialized in manufacturing Boxes Canopy and Machine Covers. Along with that we offer Powder Coating Plant and Fabrication Services that are a class apart.